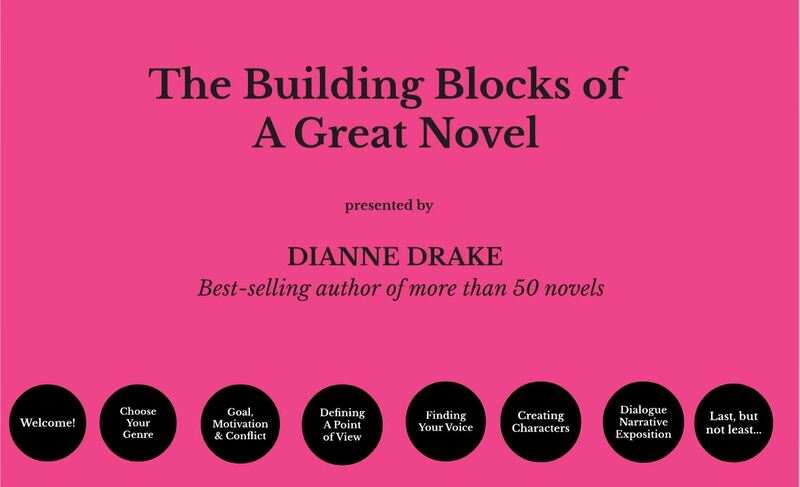 MWW announces its the newest MWW Ongoing course, “The Building Blocks of a Great Novel,” taught by the bestselling author Dianne Drake. This 6-unit course also includes a manuscript evaluation. Registration is now available! Instructional sections that you can read on your own time, at your own convenience. This Prezi format is not a live presentation, and new lessons will not “drip” at various intervals during the course. Once you have registered, the entire course will be available to you, to access at any time you wish. Assignments for completion at your own pace–designed to help you put what you learn into action. AND each student will receive A FREE MANUSCRIPT EVALUATION AT THE END OF THE COURSE. Translated to mean 10 pages of a manuscript critique along with one deep editing pass. CHOOSE YOUR GENRE: a discussion of what genre is; how to find the genre that works best for you, a reader’s expectation of genre, and much more. GOAL, MOTIVATION & CONFLICT: the backbone of all great novels. What is GMC? How do you use it? Define it? Why developing your GMC will give you a head start on your novel that many writers skip. Also, how to apply GMC in your work for the best results. DEFINING A POINT OF VIEW. Every book has one, so do most major characters. POV gives you a perspective of your story that no one else has. It also defines you, as writer, in your story. FINDING YOUR VOICE. It’s unique. It’s you on the page-the way you present your story and yourself. It’s what your readers will relate to more than anything else, and what your editors expect to be so “you” your work will stand out in the pile. And, it’s what brings readers back to you and your books. CREATING CHARACTERS. Good stories have good characters, great stories have great characters. This lesson will teach you everything you need to know about your characters, from naming them, to giving them the perfect backstory, to scripting them in a manner that your readers want more of them. DIALOGUE, NARRATIVE & EXPOSITION. In other words, the whole ball of wax. How your story goes down on paper. Word choices. What resonates with readers and what doesn’t. This is the nitty-gritty about your writing and how to make the most of it so your next book contract will come knocking on your door almost before you’ve completed the current WIP (work in progress). Looking to prepare for NaNoWriMo? This six-unit series is for you! The cost: $149 (includes manuscript critique!) Register HERE. Join the course’s private Facebook community! When you register for this course, you will be invited to a private Facebook group created for live interactions and questions. I encourage lots and lots of questions and comments, anything you wish to address. I will also drop several handouts into the files — things I like to share with my students that may not necessarily have a proper place in the class. In addition, I will check in on the Facebook group several times a day, to answer questions, participate in discussions or to simply see how it’s going. If Facebook isn’t your thing, or you wish to discuss something privately, I’ll be happy to keep you caught up on my private email. There wasn’t a time in her life when Dianne wasn’t writing something. The first real try she remembers came when she was aged 6, with a poem titled, “If I Had a Pony.” It was a lame attempt at getting her parents to buy her a pony, which didn’t work, but in that poem Dianne discovered she loved to write. So, she did…through grade school, high school, college school, music school, nursing school, grad school…It was always there. In Dianne’s life, there was always something to write about. Funny thing was, she wasn’t taking the hint. Not even when articles she was writing for professional medical journals were being published. One day, though, Dianne’s mother died. She was too young. And she also died unfulfilled…full of hopes and dreams she never went after. This was at a time when Dianne was facing a disability that would eventually leave her with some very difficult physical challenges. Still, she didn’t want to end up like her mother, wasting a life of dreams that never had a chance. But, what to do? This is when, what Dianne calls, “The Post Card from God,” arrived. It was an ad for a writing workshop being held in Muncie, Indiana. Midwest Writers Workshop (1993) as it turned out. So, in her hand she had the opportunity to fulfill a dream she’d never really latched on to, but one that had always latched onto her. But, could she write for real? She’d always written, but to be a real writer? Dianne’s next two books from Harlequin Mills & Boon Medicals will be released simultaneously in January, 2018. Be on the lookout for Reunited with Her Army Doc and Healing Her Boss’s Heart — two connected stories about the healing powers of love, home and friendship. Also, keep up with Dianne’s new releases and news on her website at www.Dianne-Drake.com and her Facebook page DianneDrakeAuthor.